I'm interested in the 2012 Chevrolet Camaro RS you have listed on ExoticCarList.com for $18,498 Or Best Offer. I would like to know more about this vehicle. 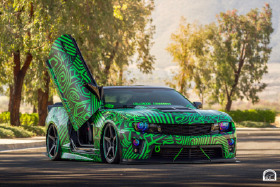 There is OVER $40,000 in Custom Modification on my Camaro. Only the best shops in San Diego have worked on my Camaro, most of them owned by good friends of mine. My Camaro was on display in Las Vegas as a FEATURE CAR at SEMA 2017. It was also on display at the 2018 SAN DIEGO INTERNATIONAL AUTO SHOW. My Camaro has WON 10 1st Place Awards and 1 3rd Place Award for BEST IN SHOW. One of the Awards was 1st Place at the GoodGuys Auto Show for Best In Show. The list of modifications is extensive, NO Expense was spared for this build, ONLY the BEST. 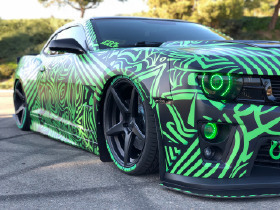 - Full Custom Printed Vinyl Vehicle Wrap (KI Studios) (Original Paint Color of the Camaro is Black, Under the Wrap) - Custom Air Suspension System (Air Lift Performance) - Custom Racing Seats with Green 5 Point Harnesses (Cipher Auto) (OEM seats still available) - Custom Built Sound System (DD Audio / La Jolla Audio) - Custom Carbon Fiber Roof and Interior (HCM Carbon) - Custom Color Changing Headlights, Underbody Lights and Interior Lights (Color Mill) - Custom ZL1 Front Bumper (Phastek Performance) - Custom Built Front Fenders - Custom Built Racing Chin Spoiler, Wicker Bill Spoiler and Rear Defuser (ZL1 AddOns) - Custom Built 20" Wheels with New Hankook Ventus V12 Tires (Velgen Wheels) - Cold Air Intake System (Cold Air Inductions) - Custom Muffle Delete System (OEM mufflers still available) - Custom Vertical Door Kit (Vertical Doors Inc.) (OEM door hinges still available) - Entire Camaro has been Ceramic Coated to Protect from UV Sun rays (Visual Detailing) - Camaro has been Professional Detailed by Hand once Every Week (Visual Detailing) AND SO MUCH MORE!!!! !